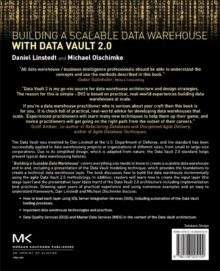 The Data Vault was invented by Dan Linstedt at the U.S.
Department of Defense, and the standard has been successfully applied to data warehousing projects at organizations of different sizes, from small to large-size corporations. Due to its simplified design, which is adapted from nature, the Data Vault 2.0 standard helps prevent typical data warehousing failures. "Building a Scalable Data Warehouse" covers everything one needs to know to create a scalable data warehouse end to end, including a presentation of the Data Vault modeling technique, which provides the foundations to create a technical data warehouse layer. 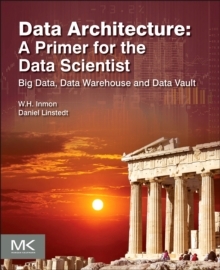 The book discusses how to build the data warehouse incrementally using the agile Data Vault 2.0 methodology. In addition, readers will learn how to create the input layer (the stage layer) and the presentation layer (data mart) of the Data Vault 2.0 architecture including implementation best practices. Drawing upon years of practical experience and using numerous examples and an easy to understand framework, Dan Linstedt and Michael Olschimke discuss: How to load each layer using SQL Server Integration Services (SSIS), including automation of the Data Vault loading processes. Important data warehouse technologies and practices. Data Quality Services (DQS) and Master Data Services (MDS) in the context of the Data Vault architecture.